The last month I've been working a lot on my bow hold. My bow hold is wide with the middle and ringfinger close to each other, and the index climbing high up on the stick. I usually rest my pinky on top of the stick. 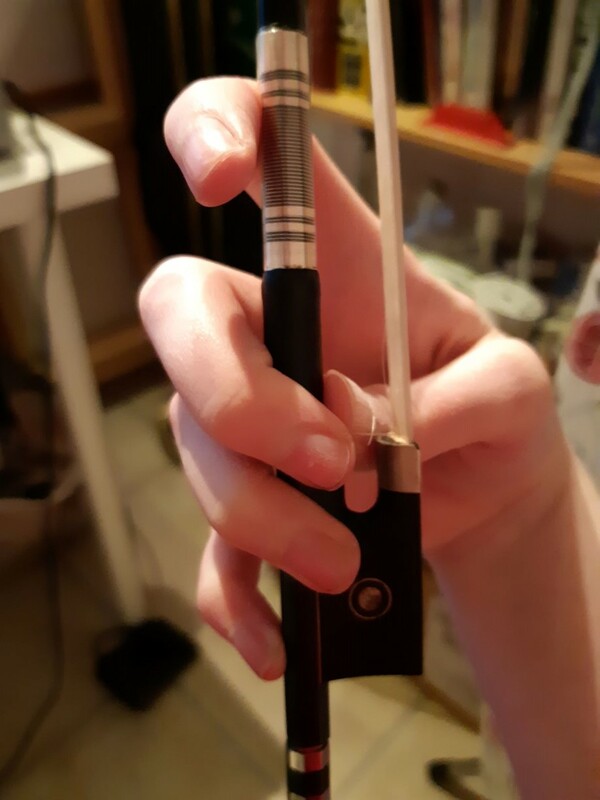 Although under my practice session today, I accidentally found out that I gain a whole lot of stability when I put my pinky on the side of the stick, resting the first joint on the top when having my bow tilted. When playing flat haired I still find the use of the pinky on top to be the most stable. Is it acceptable to keep the pinky like that when tilting the bow? I have to admit that I find the hold to be quite comfy, but I don't want to do so if it's going to hurt me in the long haul. This is how I normally hold my bow, and the second picture is how I hold the bow with the pinky on the side. Feel free to comment on the general hold, I'm pretty much lost at this point. I hold it closer to the end than that. I suppose, but I'm only guessing, that the first finger is meant to go on the leather, not the winding. On an expensive bow, I guess it will be cheaper to have the leather replaced when it has worn out. I used to be very uncomfortable keeping my pinky curved, but it seems OK nowadays. I wanted to use it for control, but curved it seemed unstable and lacking control. I forgot to mention why I'm keeping the first finger so high. When I'm having my first finger on the grip I get cramps within a minute max. Having it spaced out allow me to be able to play for an hour without any discomfort. Although I try to avoid playing for so long at the time. I'm guessing because I haven't yet developed the flexibility and strength in my hand yet. It may be that you are tense - I had to be told a few times to lower my right shoulder. Also your thumb is concave in the lower photo. Might be worth watching what it does when you play. 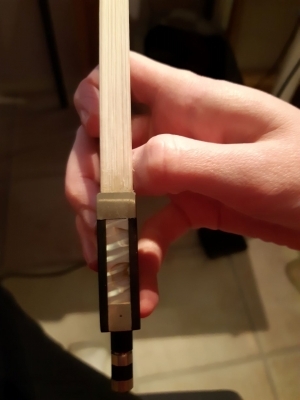 What I've understood is that the pinkie should be not exactly on top of the stick, but on the "inside", just a little closer to you - so that it counterbalances the action of the first and fourth fingers. I think that's what you're doing on the photo ? It's what feels most comfortable for me in any case (with flat or tilted hair, regardless). Yes, I've a teacher. I become tense when I've to place my index closer to the middle finger, other than that I don't experience tension in my bowing arm. I've been working on it though, I'm probably a cm closer to my middle finger now than I was a month ago. It's more like I rest the flesh between my nail and first joint on the stick. I guess it could work as a counterbalance, but I haven't seen anyone go so far as not using the tip of the finger at all. @HP your bow grip looks similar to the hungarian (russian) bow grip, allowing more pressure to the strings to give you louder projection. I actually hold the leather with my thumb and middle finger, it is padded and seems to help with the tired thumb, also it seems like the bow would resonate more with less contact to the wood of the bow at the point where you are squeezing it. Just my way of thinking. - the most important is the "vertical" counterbalance between index finger (pushes down, adds pressure) and pinky (push down with the pinky only, tip of the bow will lift). This pinky action is especially important at the frog. At the tip of the bow I find the pinky to be mostly useless - mine actually leaves the bow occasionally. I don't know if vids are ok but this is approximately how I hold the bow (never mind that it's in french, the images are sufficient). But there are plenty of ways to hold it. I appreciate you posting that, thanks. It answered a coupled questions. @wtw That answered a lot of what has been bugging me actually. Thank you. Lot's of great comments above. Not all hands are created equal so not all grips should be the same. The best grip is the one that will allow you the most flexibility and allow your hand to be more relaxed. Keep up the great work. @Fiddlerman I tried to emulate your hold, but I think my hands must be smaller than yours, as it's pretty comfortable for me to stay on the leather. It never did me much harm on the piano, but then not much requires great spans other than Liszt. My handspan is 8 3/4". No, I checked again, I'm simply holding the bow closer to the end with my thumb inside the frog. Maybe it's because my teacher is a violist? I'll try to stay aware of what I'm doing. Thanks for the encouragement. My LH is the one that needs the work. It takes superhuman effort to keep the wrist straight, and getting the thumb and the middle finger in the right place is difficult. If I let the first finger dictate, then the middle finger is impossible to position, so I'm letting the first finger be subservient to the middle finger. wish I had small hands sometimes. 4 inches wide and a span of 10 inches, makes hitting some of the notes a pain. Everyone's bow hold will be a little different just because of hand shape. Yeah.... I'm 5'10 carried 270 to 280 pounds at less than 10% body fat for over 20 years. Now at 50, 260 lbs and quite higher body fat %, I wish I had never been so big. I see others in videos and the violin looks huge when they hold them, and when I have it in front of me it looks like a child's toy. I wish I had Andrew Fryer's hands too, or an asian girls hands. Yeah I can run all the notes in 1st position without moving my hand, cover f and d on the e string at the same time, but like e and f on the d string, I have to shift slightly up when they fall in order.